I made yesterday some testing with my 12y old Celestron C8 SCT and reducers/correctors. For DSRL sensor size C8 SCT does not give good flat field and for photographic use reducer souds to be good solution. I have 2"/SCT thread connector, so i was able to test all 2" correctors with C8 SCT. I made testplan, and decided to try everything i have. First i collimated my C8, it was i little bit out of collimation. 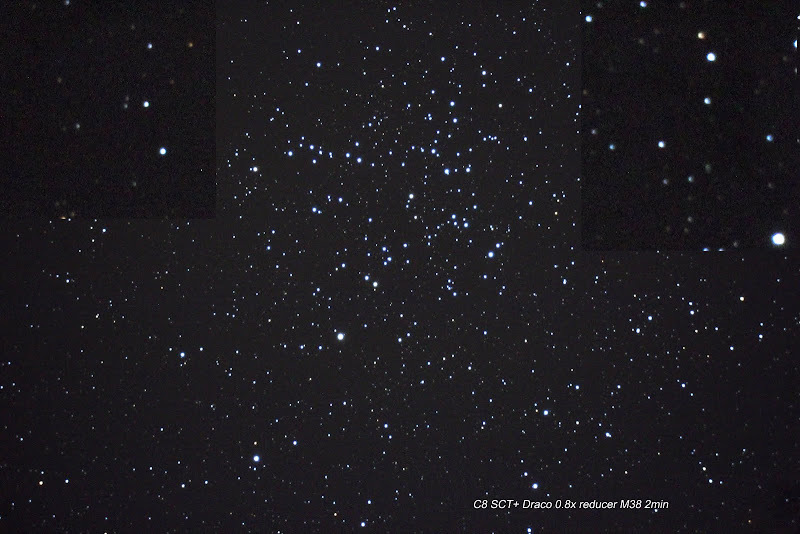 Testin object was M38 in Auriga, i made focusing with bahtinov mask by using Capella. -C8 and TSKomakor, komacorrector for Newtonian telescopes. I took crop images mainly from 2 corners and zoomed them bigger in Photoshop. Also some curves and levels adjustments is made to images. 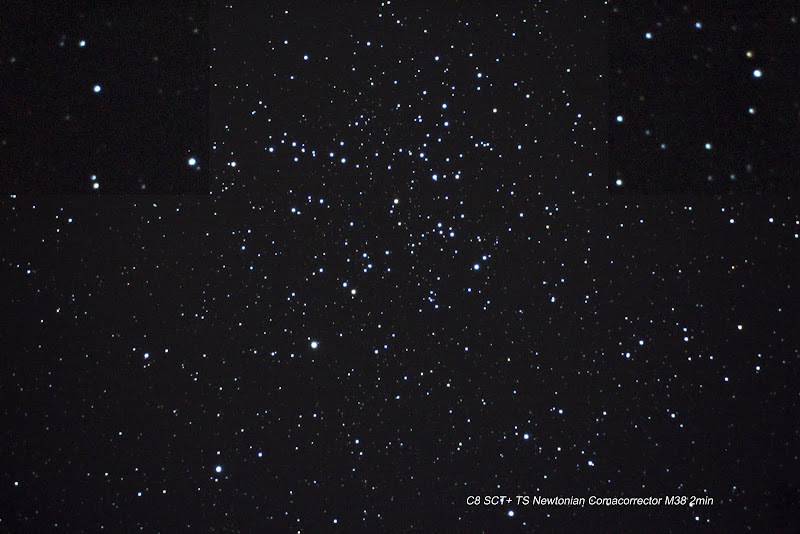 C8 and Celestron 0.63xreducer. Distance abt 100mm, does not look good at all. 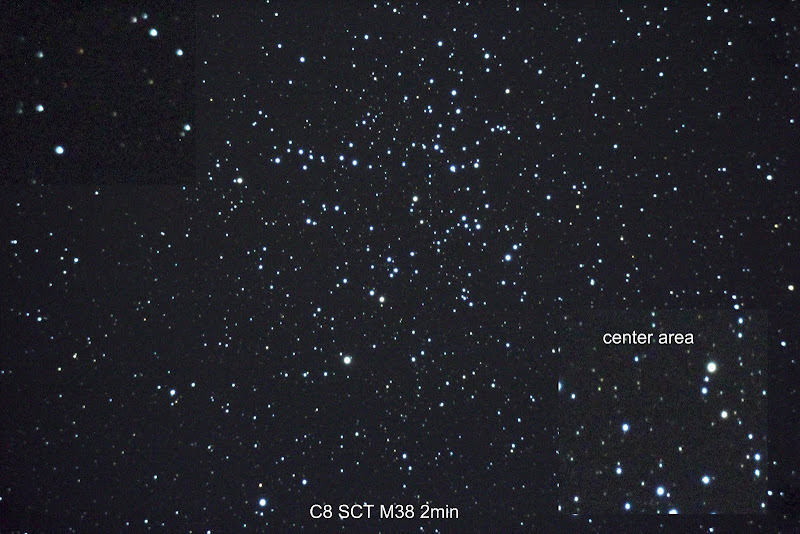 C8 and Baader alangee2, "comet generator" 2 extensions and short baader sct/t2 connector. Televue TRF2008. Can not work, it is made for 400-600mm fl range, designed to use with short apo refractors. 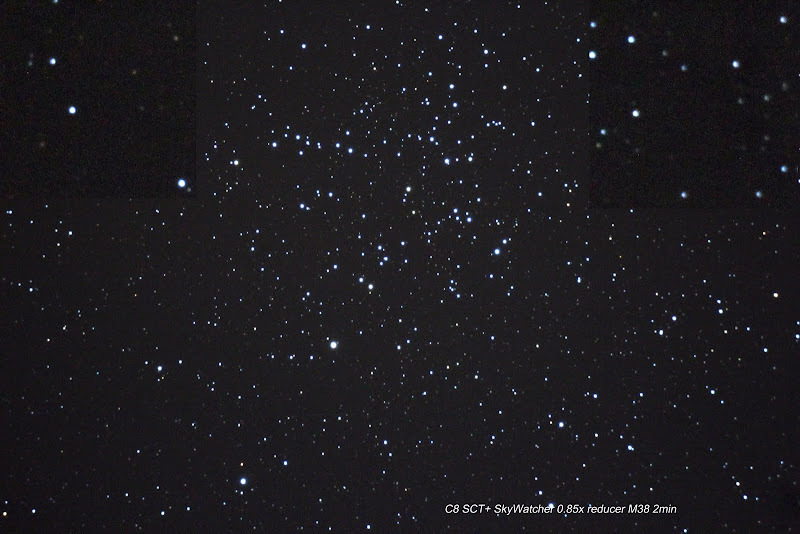 Watch and get surpriced..
C8 and SkyWatcher 0.85 reducer for 120mm refractor. 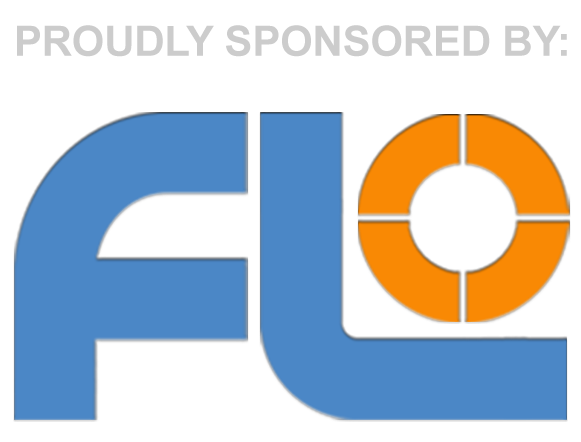 TSFlat, made for refractor use. Some excellent test results. Plenty to think about there. So it seems that strong field curvature corrector (like the TRF2008 for bright APOs) wins Maybe you could combine a reducer with that flattener? And also play with f/6.3 Celestron reducer distance (110-120 mm). Some say that all those SCT reducers have a very short window around the optimal distance for giving good corrected field. Thanks for this test. I am surprise the apo flatteners worked better than the SCT flatteners. I have been looking for information about the Alan gee, but this test just told me I can forget about it. However, I find the SCT reducer more pleasant for the eye at first glance, probably because less tracking error were reviewed at the shorter focal length. Thank you for your comments. I was also surpriced that apo reducers/flatteners worded so well. I will continue this test later with Celestron 0.63x. I am trying to find optimal distance between reducer and camera sensor. If anyone here having experience of good distance, i would be happy to get that information. I have read that it should be near 110mm. Alangee2 was big dissapointment with DSLR size sensor, i will not recommend anyone using bigger sensors to buy that one. Looks that you can get acceptable results with smaller CCD sensors. I have tried to find optimal distance earlier, but did not get much difference what ever distance i tried. I once did try the Alan Gee vs the Celestron 0.63 Fr/FF on a C8. I don't have the pictures any longer, but if my memory serves me correctly, the AG had a wider field thatn the C 0.63. However, when cropped to the same FOV, they both showed about the same amount of distorsion. Much as in your pictures. Very very interesting.........I am going through the same problem. 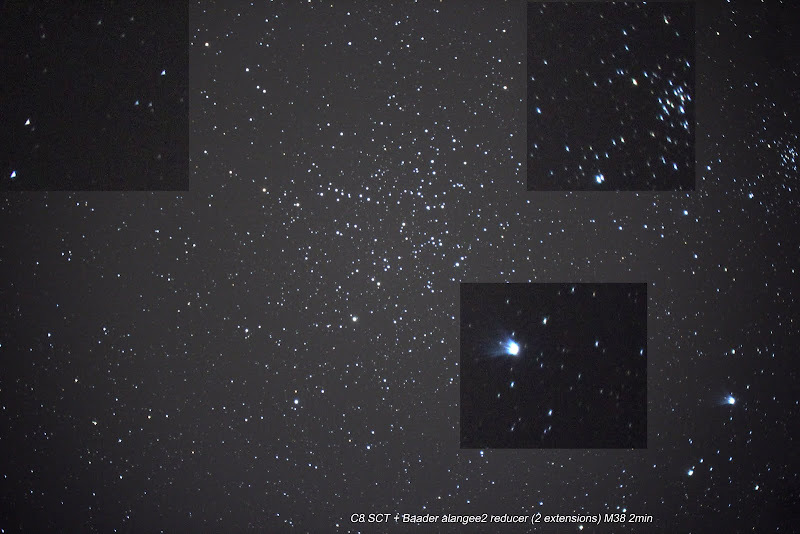 I curently use the Meade 4000 0.63 reducer/flattener on a Celstron C8-XLT and are experiencing the problem similar to that depicted in your Celestron 0.63x image. My backfocus distance is set to 105mm. I have also found that bad collimation makes the coma (or distrotion) worse, hence I am going to re-collimating my C8. A comment on this from more experienced users would be welcome. Rauno, what is your collimation like now, does the distortion shape change with different collimation? 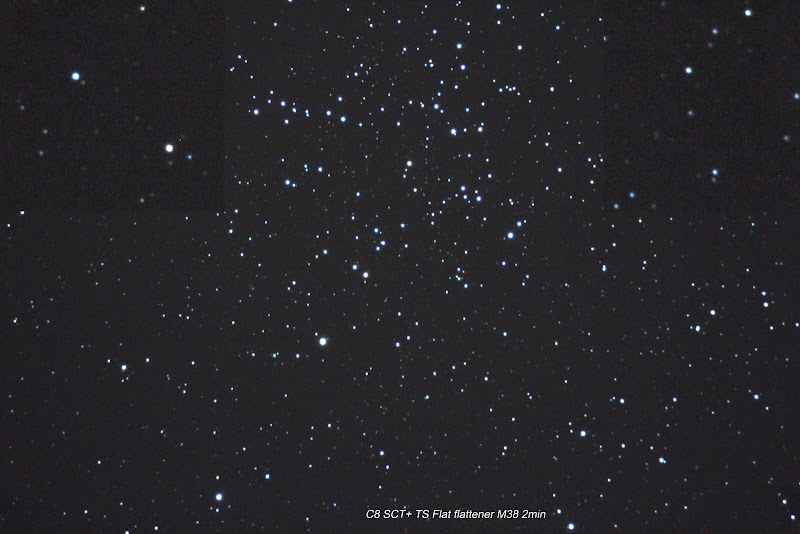 Before test, i recollimated my C8 with Duncan method mask, befor it was little bit off, after collimation so close that i could see with my eyes. I can warmly recommend to make duncan style mask, it helps a lot of SCT collimation. Seeing was quite bad when i collimate, and it was very difficult to see clearly diffraction patterns. But with Duncan mask, i saw easily little bit out of balance "mercedes" cross, and get it quite perfect. In my earlier test images of Celestron reducer distortion was maybe little worse, but not much. I recheck yesterday distance between Celestron 0.63x reducer and camera sensor and it was 104mm, so it should give best results. I also try to get more images, weather get bad soon, but i managed to get something. I tried with with different distances, 90mm, 114, 124, 134. None of them get good results and all show distorted stars in corners. 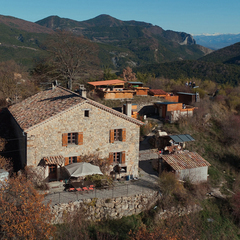 I downloaded images in same picasaweb album. Interesting thing is that it looks that you can get better results with any other reducer than SCT models. Maybe 0.63x is too much reduction? I had Optec 0.5x FF/Corrector and it gave very nice stars in the corners for 2/3" ICX285 CCD (it doesn't support big diagonals)... but it has quite low ccd-reducer distance. Thanks for link I will certainly follow it. Someone is going to beat me up suggesting this, but, it seems like an SCT with/without a reducer/flattener and a large diagonal CCD will not cut-the-mustard if you want top quality images? Ummm....I feel a Baby-Q coming on!! I have both and agree one hundred percent. The standard 6.3 reducer is disappointing on larger chips. Meade and Celestron obviously agree as well because they both redisgned their SCTs for flatter fields! Unfortunately they failed to develop matching reducers and it seems that flattening the Edge is very difficult. The Meade responds, if I'm not mistaken, the the AP flattener. I bought the Optec Lepus reducer specifically designed for the EdgeHD 9.25. I have yet to test it properly, though. Will report on that as soon as I get everything functioning properly and feel comfortable with it all. The Meade responds, if I'm not mistaken, the the AP flattener. Olly, I saw an image only yesterday taken with an Edge HD with AP flattener and the stars at the edges where anything but round. 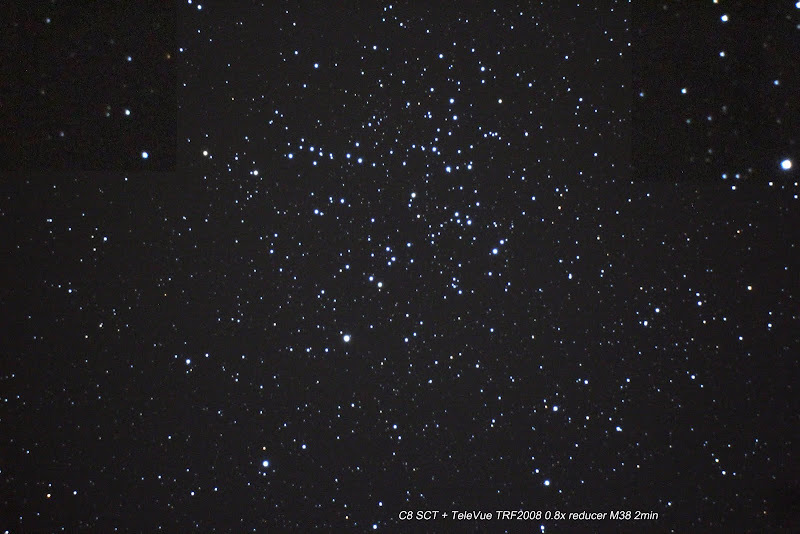 It was clear here last night, and i took test images from M1 with C8+ TeleVue TRF2008 reducer. 2min subs total 30min with EOS 600D. -5C and icefog in air, corrector of C8 also get frozen from inside! It has been so wet December, raining water almost every day, that my scope seems to get moisture inside, even protective caps have been in place. Anyway i took it inside, and will dry it well. Curves, levels and colour adjustment in photoshop, but havent touch stars in anyway. Thanks for this great test. I have added some test images to my picasa album, with C14 (my main istrument now) and also with Megrez 90. Can I ask what the ccd flattener spacing was for the ts flat? Sorry for late response, i was using about 109mm spacing from thread of flattener to sensor. I haven't try other spacings. Thanks for posting, a very thought provoking comparison. To my eyes the last two taken with flattner and comacor sre the best ones. Now if someone could do the same for the SkyWatcher 127 Mak then it would be interesting. Hi Per, just wondered if you ever did any tests with Optec reducer ? Hi guys, a complete noob here so please explain to me like I am a five-year-old. I have a C8 SCT, Celestron f/6.3 which I'm attaching right to the rear cell (i.e. before the visual back). Then the visual back goes to the f/6.3. I have a Celestron T-adapter and a Canon EOS T-ring for my Canon 450D. Now, what do I need to buy to be able to adjust the spacing everyone here's talking about? I also have the ASI120MM-S camera, do I need to buy anything else for it (to be able to adjust the spacing - is that even needed for a ccd)? With your DSLR arrangement the distance from the reducer to the CCD chip in the camera will be close to the design position of 110mm. Telescope Service/ Baader can supply "variable T thread adaptors" to make life a bit easier.